i’ve been on a makeup kick lately, so i thought i’d share some of my most recent purchases with you! nicole of fashion forestry recently turned me on to ysl lipstick. i hadn’t bought myself fancy department store lipstick in a very long time, so i was beyond excited to discover these rouge pur lipsticks in le rouge, le fuchsia, and le orange. besides the fact that the colors are perfect, they glide on like a dream and are intensely moisturizing. not to mention the classy packaging! 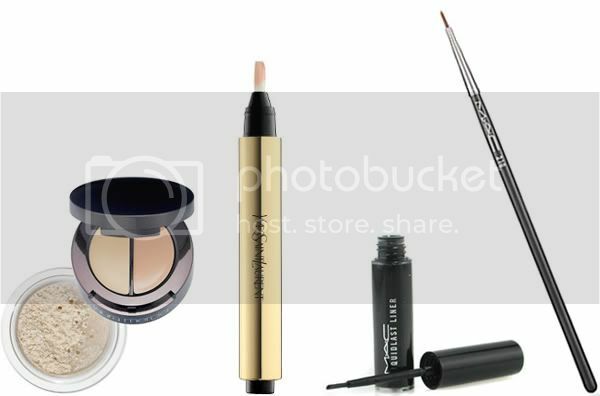 in terms of eyes, i’m loving my laura mercier undercover pot concealer and ysl touche eclat, which is basically a luminating highlighter. when it comes to eyeliner, i’ve always done the basic black winged liner, and i’ve tried virtually every brand under the sun. i recently discovered this intensely long-lasting, waterproof eyeliner from mac called liquidlast liner. the girl at the counter told me i could literally go swimming and it wouldn’t come off. this is pretty awesome since i’ve always struggled with my mascara and eyeliner rubbing off onto the bottom of my eyes by midday. but beware, it’s a very thick and sticky formula, so you’ll need a very precise brush to apply without caking it onto your eyelashes in the process of application. Love this make-up post! 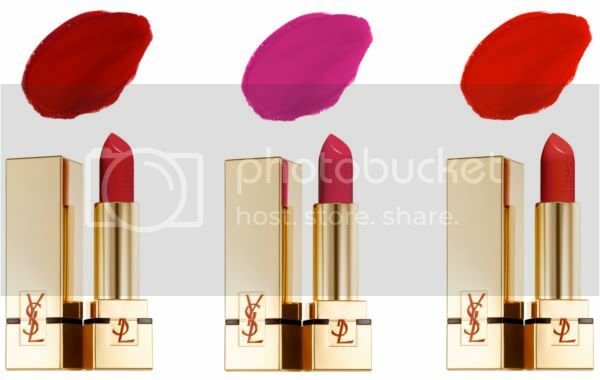 There's a lipstick by YSL that I really need, but I can't remember the colour's name, argh. I've always wanted to try the YSL Touche Éclat, because I've heard that so many make-up artists use it on their models and it is amazing! Supposedly you can use it anywhere – under your eyes, your lips, your cheeks, etc. What's your take on it? my mom wears & swears by le fuschia! it's amazing! i am more of a MAC cosmetics girl, but love everything you listed! And those shades are fantastic! i recently bought MAC russian red lipstick, but i havent worked up the courage to wear it out in public yet! i love makeup packaging so much … it's almost nice just to buy to decorate! ha! I love YSL touche eclat. I've been using it everyday for a decade now recommended to me by my former roomate who was a model. probably the best piece of advice I ever gleamed from her! lol. Touche eclat is amazing. Thanks for the tip on the mac liner though. My "wingtips" always get smudged up the side of my face so I'll give this a try! Thanks for posting this! Definitely looking into that Mac liquidlast liner now. I really need some orange lipstick in my life. Gonna try and save up for it..
My mother swears by the YSL touche eclat thing! glad you posted this because i'm makeup-obsessed lately too! i think its the weather- it is less easy/fun to dress up. anyway, i'm going to check out those ysl lipsticks.